"Poised between intransigent scepticism and uncritical credulity, it [science fiction] is par excellence the literature of the open mind." A device to automatically locate veins for intravenous needle insertion. The device was able to insert intravenous needles, finding veins easily. "Place your hand on the board to the left. Do not move. You will feel a slight prick as the intravenous needle is inserted." Hall looked over at the screen. It flashed a color image of his hand, with the veins showing in a pattern of green against a blue background. Obviously the machine worked by sensing heat. He was about to protest when he felt a brief sting. He looked back. The needle was in. From The Andromeda Strain, by Michael Crichton. This is a pretty slick idea. It was implemented in 2006. 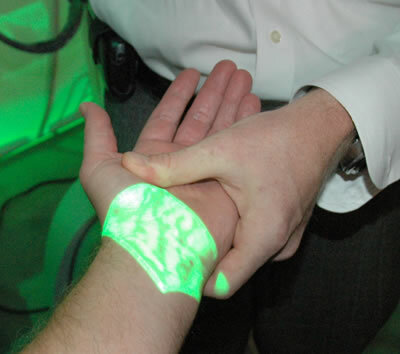 Take a look at this picture of my own wrist; the VeinViewer provides vein contrast enhancement. See also the Fujitsu PalmSecure Hand Vein Scanner and Palm Vein Authentication.